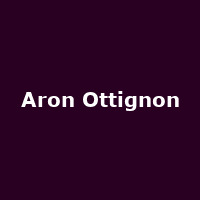 "Aron Ottignon is an extremely gifted pianist. Prizes have been rained on him ever since he began playing, and he could have fallen into the virtuosity trap and lent his talents to Rachmaninoff and Ellington, hiding behind those ten fingers. But an authoritative persona and some remarkable artistic convictions were maturing beneath the surface in this child prodigy, and today, from Auckland (where he was born in 1982) to Paris, and from Woodkid to Stromae, people have seen that the winding path he's taken was guided by an arrow-straight ambition that finally materialised in a first album." He released his debut EP, "Nile" in 2017, followed by the EP: "Hot Tub", released on Blue Note records.